The reason the game made No. 1. So, that's it. The new alpha game of VGMania has been crowned, and as you can imagine, I'm at a total loss of words here - after all, I had my suspicions about this game. Grand Theft Auto has been one of my favourite franchises ever since I finally snapped the cork on Grand Theft Auto: San Andreas back in the day. I was like the gamers who still haven't tried out Grand Theft Auto in these times; they don't really know what it's about and think it's all hype. I was in the military when San Andreas came out; we had a PS2 at the barracks and this one guy constantly interrupted my SmackDown! vs. Raw sessions 'cause he had just bought San Andreas while on leave, and he wanted to play that game. I had no choice but to give in since the PS2 was his, just a few of the games were mine. I just secretly cursed at him for costing me my virtual wrestling sessions because of an overrated "racing game". Yeah, well, words can't describe how ignorant I was at the time when it comes to games in general. I knew a lot about 8- and 16-bit games, but hot titles of the time were a mystery to me. I only bought games that really stood out for me, personally. Like Final Fantasy, Resident Evil, Silent Hill, Kingdom Hearts, Metal Gear Solid, etc. Basically, games spawned or spun off from franchises I had known for a long time. Of course I knew Grand Theft Auto - the first game, that is. Not long after my brother bought me San Andreas, I myself bought Vice City (my brother can't stand mafia-related plots), and a bit later, Grand Theft Auto III - the exact opposite order of things. I still have never finished Grand Theft Auto III, now that I think of it. That was a short recap of my early history with Grand Theft Auto. During this soon-passing console generation, Grand Theft Auto IV was one of the two reasons I bought the PlayStation 3 in the first place, the other and the even more determining factor (due to its PS3-exclusivity) being Metal Gear Solid 4: Guns of the Patriots. Even that was over five years ago - where has the time gone?! Well, now it's time to send the PS3 on its way to Valhalla with a game from the very same tree. I have one more new game for the PS3 coming up next month, but I think that will be the last new game I'll buy that is not slated for daylight on next-gen consoles as well. And, honestly, I do not believe Grand Theft Auto V will be outdone by any game, not this year and not during what remains of this generation. I somehow have to find it in myself to cut the next few brand new games a slack - not everyone's a Rockstar. To get to the point, GTA Online launches tomorrow and that will keep me busy for a while. However, it's going to be less than a month before the next new game comes along, and to keep in touch with realism, I'm not going to play GTA Online 24 hours a day. Be the game as good as it is, multiplayer is still not wholly my thing, and I don't know what's going on with my friends, who were really excited of joining my new crew and taking part in different crew activities, but only one of them has responded to my request to join. So, this isn't working out entirely as planned, and that's a blessing in disguise, 'cause it leaves me good time to revamp this lot and deliver a few reviews. I'm thinking doing a few totally random reviews for starters, of random games, but from specific systems - I think this is a great time to break in the three new systems, starting from the oldest. 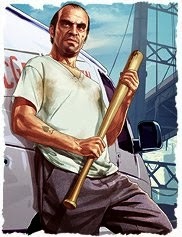 So stay tuned - there is life after (or actually, during) Grand Theft Auto V.